Costs in beef cattle production continue to rise. Winter feed and summer grazing costs make up approximately 60 to 65 percent of the total cost in cow-calf production. Grazing crop residues is one way to help you reduce costs and improve your bottom line. Corn acreage in North Dakota has risen significantly, and corn for grain is a major crop across a large area of the state. The advent of varieties that are better adapted to northern growing regions, along with genetically modified organism (GMO) traits for herbicide and post-resistance, have made this possible. Corn grain now is produced in almost every county in North Dakota. What does all this have to do with cow-calf production? As corn production stretches north and west across North Dakota, so does the opportunity to graze corn residues in the fall and winter. The purpose of this publication is to describe the nutritive value of corn residue and to make recommendations related to using corn residue in beef cattle operations. Abundance — Cornfields produce an abundance of forage. Corn residue remaining after harvest includes the stalk, leaf, husk and cob, as well as downed ears. The amount of downed ears varies with the corn variety and weather conditions but is typically 3 to 5 bushels of corn per acre for Bt varieties, with greater amounts of downed ears for non-Bt varieties. 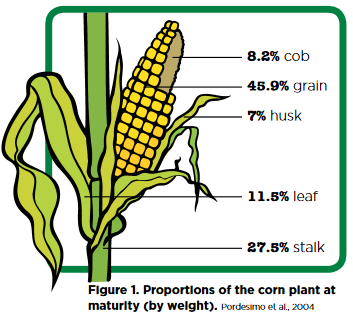 Figure 1 shows the proportions of a corn plant at maturity. Approximately 50 pounds of residue is left on the field per bushel of corn harvested. For example, if you harvest an acre of corn yielding 120 bushels/acre, you can expect about 6,000 pounds of residue per acre (120 bushels/acre times 50 pounds of residue per bushel). Cattle won’t consume all of the residue in the field. In fact, they prefer the downed ears, as well as the leaf and husk material. A good rule of thumb is to figure a maximum of 25 percent consumption due to the selective nature of the cows’ grazing habits and the losses associated with weathering and trampling. In this example, that would equate to 1,500 pounds of consumable residue (120 bushels/acre x 50 pounds or residue/bushel x 25 percent harvest efficiency = 1,500 pounds of residue consumed/acre). In some cases, utilization will be as low as 20 percent when increased losses due to excessive trampling, wind or rain/snow events are taken into account. Producers should plan for 40 to 60 days of grazing per acre when grain yields exceed 100 bushels per acre (and assuming each cow has access to two acres of residue). This allows the cow to be selective in what she consumes so that she can select the higher-quality material. Forage Quality — Table 1 gives the nutrient composition of various parts of the corn plant. The residue components with the greatest energy value are the husk and leaf. The cob is relatively digestible but very low in protein. The stalk is low in both protein and digestibility. Cattle are selective grazers by nature. They choose the most palatable and nutritious plant parts first. As a consequence, the longer the cattle graze a particular cornfield, the lower in nutrient content their diet will be. This is due to the cattle selecting the higher-quality material first and the loss of nutrients due to weathering. Longer-term corn residue grazing (on the same field) may require protein supplementation to meet the nutrient needs of gestating beef cows. 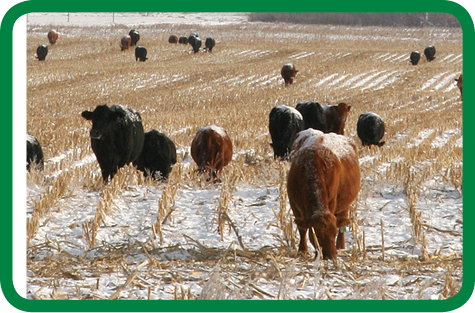 Lengthening the Grazing Season — Corn residue can be grazed long into the winter feeding period, provided snow or ice does not limit the cows’ selectivity and grazing ability. The length of time cattle can graze will vary from year to year. Once fields are snow-covered, the ability of the cow to select the higher-quality portions of the corn residue is lowered. Ice cover due to freezing rain or freezing and thawing of snow cover also will limit the cows’ ability to access corn residue. Lack of Fencing — Many cornfields are not fenced. However, the use of high-tensile wire and solar-powered electric fence chargers can make this task more manageable. Lack of Water — Irrigated fields may provide opportunities to water from the irrigation well with a little bit of work to install a temporary tank, tank heater and float system. In other areas, water development may be necessary. Tapping into an existing rural water source or nearby well may be an option. In some cases, these options may not be available, and hauling water may be the only option. Lack of Protein, Calcium, Phosphorus, Trace Minerals and Vitamin A — Corn residue is generally low in protein, most minerals and vitamin A. At the onset of grazing, protein levels in the residue may be adequate for dry, gestating spring-calving cows. However, as the cow selects the better-quality material and weathering occurs, protein content will drop below her nutrient requirement. Protein supplementation will be necessary at that point. A wide variety of supplements can be used. Alfalfa hay, oilseed meals, distillers grains and commercial supplements all can be used effectively. In addition, be sure to follow a good-quality vitamin and mineral supplementation program when grazing corn residue because corn residue is low in calcium, phosphorus, trace minerals and vitamin A. Risk of Acidosis — If fields have greater-than-normal levels of downed ears or standing corn, the risk of acidosis or founder may increase. Gradually adapting cattle to grain prior to turnout into the cornfield may be warranted if high levels of downed ears or unharvested corn are present. Cows with experience grazing cornfields will seek out downed ears when they are turned into a cornfield. Don’t turn hungry cows into a field of corn residue. Be sure the cows are full before turning them into the field. Observe the cattle regularly for the first few days of grazing to watch grazing behavior and address any issues that arise in a timely fashion. Paradigms About Soil Compaction — Concerns about soil compaction often are cited as a reason for not grazing cornfields. However, data collected in Nebraska and Iowa demonstrate that this generally is not a major problem and grazing corn residues does not negatively affect subsequent yields. As you plan your fall and winter grazing programs, consider using corn residue as a means to stretch forage supplies, allowing the cow to harvest more of the forage and reducing cow feed costs in the process. Graze fields that have nonwinterized water sources and limited shelter, and are farther from your ranch or farm headquarters, first. This will allow you to graze nearer fields longer into the winter. One way to improve utilization of corn residue is to graze cornfields in stages. Fence off portions of a cornfield with an electric fence to allow cows to graze portions of the field more thoroughly. With larger herds of cattle, this can be accomplished by simply grazing the cows as a single herd and moving to a new field frequently. When supplementation is required, feed cows on the cornfield if possible to minimize manure hauling, provide exercise for the cows, feed on clean ground and allow cows to continue to pick at the residue as weather conditions permit. Corn residue also can be harvested mechanically for use in winter feeding programs in areas where grazing is not possible. This harvested material is referred to as corn stover. Because corn stalks are tough and large, compared with the stems of typical grass or legume forages, successfully baling corn residue with some balers may be difficult. Some manufacturers produce specialized balers just for use in harvesting corn residue. In any case, the fibrous nature of corn stover creates more wear and tear on balers. Corn residue may be shredded after combining and then raked into a windrow. This can result in some loss of better-quality forage (husk and leaf). The material also can be raked or shredded into a windrow directly behind the combine. Windrowed material can be baled or grazed. Grazing windrows may allow more time for cows to consume residue, even after a light snowfall. However, the major drawback is that it can create challenges the following spring if large volumes of windrowed residue remain on the field. The corn stalk also can contain significant moisture, even after the plant matures. This makes baling and storing corn stalks more problematic. In most cases, 15 percent or less moisture is desirable for long-term storage. At levels above 15 percent, the likelihood of molding and spoilage increases. Net-wrapped bales seem to work better than twine-tied bales due to the coarseness of the material. Transportation also can be more difficult with corn stalk bales (compared with typical forages) due to this characteristic. In most cases, you will need more net wrap or twine when baling corn stalks than for conventional forages. 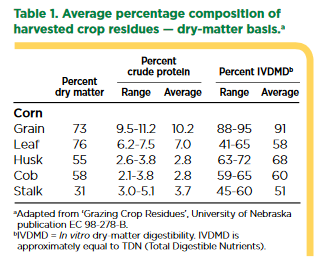 Table 2 gives the nutrient composition of corn stover. It is generally low in protein and digestibility, compared with grass hay, but higher in quality than most cereal straws. Because of the relatively low amount of nutrients available in corn stover, rations should be balanced carefully and supplemented to provide adequate nutrition for the cow herd. While grazed corn residue can serve as the sole source of forage for beef cows, harvested or baled corn stover should not be utilized as the sole source of forage in winter feeding programs because the harvested material typically contains a greater proportion of stalk and cob, which are less nutritious than the leaf and husk. Corn stover should be ground or chopped prior to inclusion in a total mixed ration. This will improve utilization and the cattle’s acceptance of the courser material. However, this will reduce the nutrient density of the ration and require additional supplementation. The courser components of ground stover are not very palatable. If bales are fed free choice, considerable waste will result. However, the stalk material makes good bedding and can be returned to the cropland as biomass. If bale feeders are used, they should be moved often to allow cows to have access to refused stalk material for bedding. The advent of Bt corn varieties occasionally results in questions from livestock producers regarding the value of corn residue from those varieties, compared with conventional (non-Bt) varieties. The greatest difference is due to the lowered amount of ear drop that typically occurs with Bt varieties. With conventional varieties, ear drop can be as great as 10 to 15 bushels per acre. However, with Bt varieties, ear drop is routinely less than 5 bushels per acre and, in many cases, significantly less than that. This ultimately means that the total amount of nutritive value (pounds of starch, energy or total digestible nutrients) of the residue in the field is lower with Bt varieties (on a per-acre basis) than with conventional varieties because less total pounds of downed ears is available for the cattle to consume. The reason is that a higher proportion of the grain is harvested rather than being available in the field as a potential feed for the cows. Very little difference occurs in the nutrient composition of the components of the residue ( husk, leaf, stalk) when components of Bt and conventional varieties are compared. These factors, as well as others that may be unique to your cow-calf operation, should be considered when negotiating leases. A one-size-fits-all approach to pricing is generally not acceptable. The best option is to get the details of the lease worked out in writing before placing any cattle into stalk grazing situations. Corn residues can be a useful feed resource for beef cattle producers. With the increase in corn acreage in North Dakota, additional feed resources for fall and winter exist in the form of corn residue. Producers with access to corn residue should considering incorporating these feed resources into grazing and feeding programs in an effort to reduce cost and improve returns to cow-calf production.